The Nissan GT-R and renowned design house Italdesign share a 50th anniversary this year, so they’ve teamed up to celebrate in what now seems the obvious way. This is the Nissan GT-R50 by Italdesign prototype, a very special and, we’re told, ‘ultra-limited’ version of the Nissan GT-R Nismo. Think far-reaching engine upgrades, bespoke bodywork, unique detailing and an adjustable rear wing. Despite the Italdesign and GT-R brands celebrating their 50th birthdays in 2018, the Nissan GT-R50 by Italdesign is an unusual move on one level because it boils down to Nissan working indirectly with Italdesign’s VW Group owners. 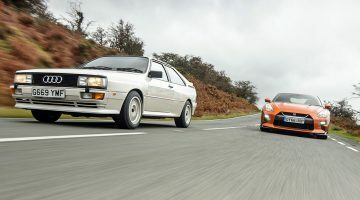 Ignoring the boring industry politics, however, we’re confronted with a vehicle that looks worthy of two of the automotive world’s most iconic names. While Italdesign engineered and built the car, the Nissan Design centres in London and America took care of the styling. Due to make its debut in Europe during July 2018, the Nissan GT-R50 by Italdesign takes the familiar, muscular but not particularly pretty lines of a stock Nissan GT-R and embellishes them with extra aggression yet, also, a bit more fluidity. The bonnet’s power bulge grows while the roof is 54mm lower and the rear window line is longer for a sleeker silhouette. The GT-R’s “samurai blade” cooling ducts behind the front wheels are more prominent and the LED headlights extend far back over the front wheel arches with a unique lighting signature. At the back, the GT-R’s famous quartet of round red tail lights remain but are updated and have a large adjustable rear wing fighting them for attention. The unique 21” wheels were created for the car and use Michelin Pilot Super Sport tyres while the whole package is finished in Liquid Kinetic Gray paint with plenty of gold highlights, including the large area at the rear that creates an unusual cut-away effect. Inside the Nissan GT-R50 by Italdesign is a familiar GT-R cabin upgraded with an abundance of carbon and Alcantara. There are Italian letter seats to sit on and the gold accents from the exterior pop up again on the instruments and switchgear. The centrepiece is a neat flat-bottomed steering wheel with carbon fibre spokes. And the changes run deeper than the aesthetics. Under the bonnet the GT-R’s hand-built 3.8-litre turbocharged V6 has been upgraded to 710bhp and 575lb ft of torque. It’s a big improvement on the 2017 GT-R Nismo’s 592bhp and it’s been achieved with GT3 racing knowhow in the form of new competition-spec turbos, larger intercoolers plus upgrades to pistons, connecting rods, fuel injectors and more. 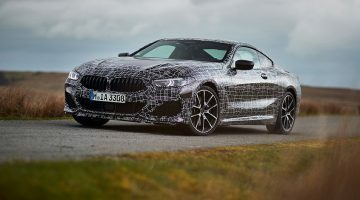 The six-speed twin-clutch gearbox, rear transaxle and differentials are also tweaked. Behind the wheels, a new suspension system based on Bilstein DampTronic adjustable damping has been developed for the car and six-pot Brembo brakes do the stopping at the front with four pots at the rear. They’ve done a thorough job but does the Nissan GT-R50 by Italdesign signify anything beyond a happy anniversary for the two 50-year-old brands? Not according to Alfonso Albaisa, Nissan’s senior vice president for global design who commented: “Although this is not the next-generation GT-R, it is an exciting celebration of two anniversaries in a provocative and creative way – wrapping one of Nissan’s best engineering platforms and Japanese design with Italian coachbuilding.” We can’t wait to get a look at it in the metal.